Bryce Canyon‘s beauty and grandeur perhaps you might not found anywhere else globally. The exciting structures are the forces of nature and the rock formations are more real in Bryce Canyon. Visitors can enjoy the horseback rides and they can taste the prehistoric moments while riding the horse. The beautiful rock structures took millions of years to craft by Mother Nature. The grand rock formation are formed by wind and rain, took several thousands of years to form an astounding sculpture and that can be enjoyed by the people and experience the breathtaking beauty of sculptured pinnacles and fluted walls as they can take a closer look. 1. Once you reach the Bryce Canyon lobby, you will be received with honor by a cowboy and lead you to the trail ride desk. 2. From here you will proceed to the loading corral where you can choose the best mule or horse for your ride. 3. Now on horseback you will start your journey from Sunrise Point and further proceed into the canyon. 4. 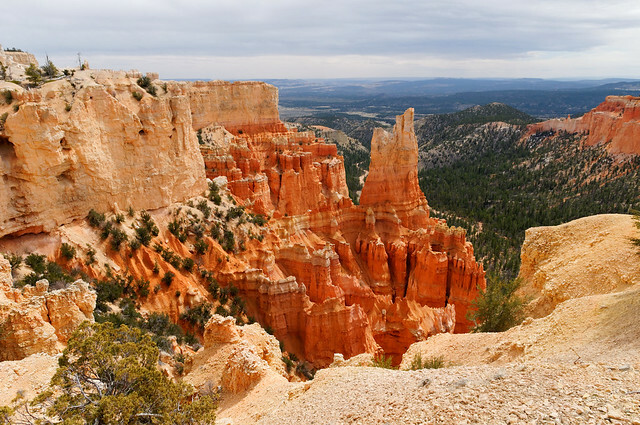 While riding the horseback the cowboys will narrate the geology and history of Bryce Canyon. You can enjoy the closer look of the Canyon and experience its exquisiteness closely and allows you to capture its beauty with your cameras. The park follows the borders of the Paunsaugunt Plateau. The western part of the park is heavily wooded uplands over 9,000feet elevation, and the on the east the difficult imprinted breaks of the rocks that plunge 2,000feet to the Parma Valley. Several transient streams have dispatched into the upland, forming a shape like a horseshoe. The most attractive and biggest is, of course, the Bryce Amphitheater. Around 6sqm away, the visitors can enjoy the breathtaking landscaping and park’s picturesque center. These beautiful structures are crafted by water and the wind, for millions of years, water continuously flowed to the rugged landscape of Bryce. The water freezes in cold winter season and the cracks in the rock expands, it is a repeated process that happens around 200 times a year. But, in summer, the water overflows from heavy rains crave into the soft sedimentary rocks and wash through the creeks. The mysterious amphitheater and the warm orange and yellow colors can brighten your moments; this is one of the best natural rock structures in the world that you don’t want to miss when you get the opportunity. These grandeur sedimentary rock formations exceed your expectations once you discover its legendary heritage. The stories that Indians explain is extremely unusual, but they believe that the creatures that looked like animals were changed into people, but these people are bad so they were turned into rocks by Coyotes, these rocks formed into different configuration. It looks like the painted faced people are huddle together before turning into stones. • The Bryce Canyon National Park is named after Ebenezer Bryce, a 19th-century Mormon settler. The ancient Indians believed that these rock formations of Bryce, called hoodoo spires, were the animal-like people who became rocks by the impish spirit Coyote. Ancients feared that the rock structures may transform back into humans. • You can order the series from the NGG (National Geographic Guide) to the NPUS (National Parks of United States) 7th edition, 2012, the articles featured in National Geographic Travelers “Cutting Loose”.